October - The Month of the Holy Rosary: Today, and every Sunday in October we have Devotions, Sermon & Benediction at 5pm. 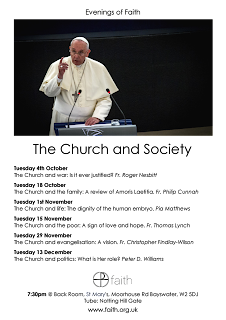 The Rosary is also usually recited after every 9am weekday Mass. Fly the flag by hanging your Rosary in your car, (the Muslims make every effort to promote theirs!) but better still, pray it everyday especially for world peace and all of your own many intentions. UCM Table Top - Cake Sale & Raffle: Next Sunday (9th October) after the 9.30 & 11am Masses. Please come along to support. Feast of the Holy Rosary: on Friday, Fr Michael will say an additional Latin Mass at 7pm. There will be confessions from 6.30 and after Mass there will be Rosary & Benediction. Rosary Crusade - this Saturday: This is the biggest procession of the year, leaving from Westminster Cathedral at 2.15pm & walking all the way across London to Brompton Oratory where we have hymns, a sermon, blessing of scapulars & Benediction. Our first communicants (special clothes) and our servers lead the way. We will meet at Clapham South Station at 1.30pm or at 2pm at Westminster Cathedral; near Victoria by 2pm. Children MUST be accompanied by their parents or an approved adult. Youth Club: 6.45-9pm in the club (basement). Open to those 10 yrs & over – bring your friends, have fun, there is football, table tennis, snack and catch up! African & Caribbean Thanksgiving Mass: Sunday 16th October at 12.30pm followed by a shared meal in the club afterwards. New Readers Rota: October - December 2016: Please collect your copy this weekend from the container in the Church Porch. First Communion - 2017: Application forms are available to be collected from Fr Chris this weekend & next weekend too. They are ONLY available from Fr Chris - so please seek him out! 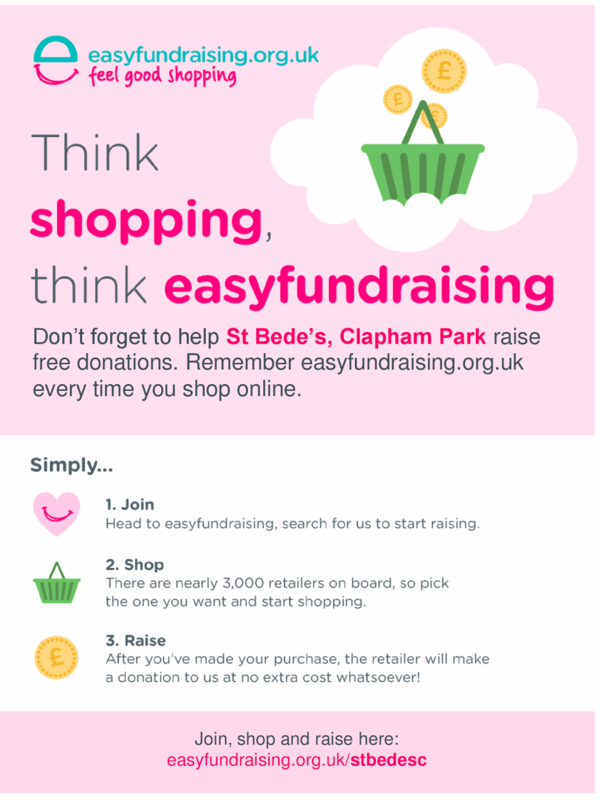 Easyfundraising: As part of trying to raise funds throughout the year towards our Diocesan obligations and Bazaar, we are registered with easyfundraising.org.uk/stbedesc which is an online portal with nearly 3000 registered retailers (many whom you probably already use when online shopping). Over the last year, only 20 people have registered to support us, but have raised over £300 between them. It is easy to register, and if you use the Donation reminder toolbox, every time you shop online you will be reminded! There is also an app available if you shop from a phone or tablet. 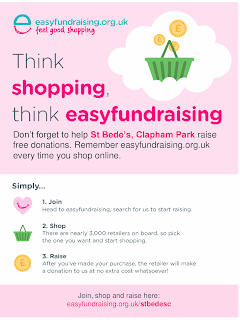 By doing this, we will receive a small percentage of your shopping bill (varies by retailer) at no extra cost to you and you don’t have to be a gift aider to join. It’s not only shops either - you can also book holidays, insure cars/property too, compare utilities, and many more – why not have a browse! Thank you to those registered already. Cleaners for this week: Saba Tekle, Nebiyat Zereome & Alem Araya Zemichael. London Evenings of Faith- September 2016: All are welcome to a series of talks on 'The Church & Society' which will take place at 7:30pm on alternate Tuesdays from 4th October 2016 (subsequent talks are 18 October, 1 November, 15 November, 29 November & 13 December). Talks are held in the Back Room, St Mary's, Moorhouse Rd, Bayswater, W2 5DJ (Tube: Notting Hill). Full dates and details are available at www.faith.org.uk/events/evenings-of-faith.